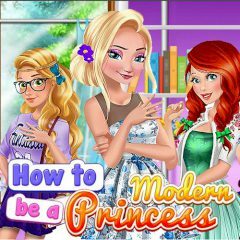 There are many ways of becoming a modern princess, but you already have something, that might help. Search for a book and read about the practical ways of becoming a princess. What outfit you will choose to impress everyone? Have you ever wanted to become a princess? We have a special gift for you! What is it? It's a book, that will help you to make your dreams come true. Read it and use some hints to choose the right outfit. Every girl should look beautiful and stylish and not it's your turn to drag attention. Pick the best outfit fro yourself and smile!